Piso Fare 2019 Promos Until 2020: Travel On Time These Holidays! Travel On Time These Holidays! Piso Fare Promo 2017: To those who are traveling via Cebu Pacific with departure from Terminals 3 and 4 are required to allot more time in going to the airport due to the ongoing road works surrounding the area which could cause traffic congestion. To avoid delay, it's best to be leaving hours before the flight. All passengers with domestic flights are requested to be at the airport at least 2 hours and those with international flights, at least 3 hours. There will be web check-ins and Kiosks check-in available to avoid queuing in long lines. CEB Web Check-in. Click the "Check-in" tab then select "Check-in Online" at the Cebu Pacific website (http://www.cebupacificair.com). For international flights, web check-in is available from 7 days up to 4 hours before scheduled flight departure. Those taking domestic flights can do web check-in up to 1 hour before their scheduled departure. CEB Mobile Check-in. Download the official Cebu Pacific Mobile App on the App Store or Google Play and tap on the Check-In option. CEB Mobile Check-in is available from 7 days up to 4 hours before an international flight, and up to 1 hour before a domestic flight. Self Check-in Kiosks. 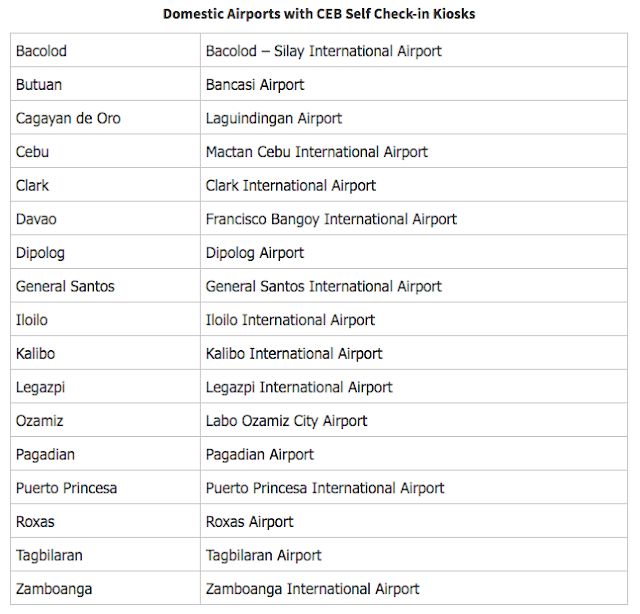 Use CEB's Self Check-in Kiosks located at the NAIA Terminals 3 and 4 and select domestic airports listed below. Passengers can use the kiosks from 8 hours up to 1 hour before the scheduled flight departure. Agent Xpress. Check-in via CEB's Agent Xpress, special roaming airport agents equipped with a tablet and a mobile boarding pass printer, from 4 hours up to 45 minutes before the flight's scheduled time of departure. Domestic web or mobile check-in guests with check-in luggage can drop it off at the bag drop counter at least 45 minutes before the flight. International web or mobile check-in guests with or without check-in luggage still need to show up at the web check-in or bag drop counter more than 45 minutes before the flight, to drop off luggage for check-in and present valid travel documents. CEB allows only one hand carry bag (maximum weight – 7 kilos) for all flights. Liquids, aerosols and gels inside a hand carry bag should be in containers 100 ml or less, and they should be placed in a clear, re-sealable plastic bag. Purchase baggage allowance upon booking, with options ranging from 15 to 40 kilos. Place easily identifiable labels and markers on your check-in luggage, and hand carry valuable items. Make time for expected long lines at the security scanners, check-in counters and immigration. We encourage guests to be at the airport 3 hours before an international flight and 2 hours before a domestic flight. Counters will close 45 minutes before the flight's scheduled time of departure. Proceed to the boarding gate immediately after completing check-in requirements as late guests will no longer be allowed to board the aircraft. Be at the boarding gate at least 30 minutes before the flight's scheduled time of departure. What to do with P999 Promo Fare?